Sticky Baked Chicken Wings are so addictive with their sweet, tangy and spicy sauce. It’s so hard to stop eating these when they are double-dipped into the sauce. Chicken wings are such a crowd-pleasing finger food that we love to develop various recipes with them. This time we wanted to have a sticky result with an addictively tasty sauce. That’s how these Sticky Baked Chicken Wings came out. I don’t know how many times we’ve made our favorite baked chicken wings recipe since we discovered the baking powder effect to make them seriously crispy. If you are still unfamiliar with that method, you have to see our Crispy Buffalo Wings baked in oven. We’ve just updated the recipe with a video. 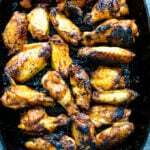 And now we have another favorite super easy baked chicken wings recipe. It couldn’t be easier to prepare a game-day party or even weeknight dinner with these Sticky Baked Chicken Wings. First rub the chicken wings with olive oil and salt and bake them in oven for 40 minutes. Meanwhile you have enough time to prepare the scrumptious sticky sauce. Just whisk ketchup, vinegar, soy sauce, lime juice, chili powder and honey in a medium saucepan and cook until it thickens. Toss the baked wings into the sauce and bake 15 more minutes. They are done! These Sticky Baked Chicken Wings are luscious as they are. If you want an even better result though, which means dirtier hands (who cares? ), you can give them a second toss with the sauce. Oh my goodness, these are so tasty, sticky and succulent! The sauce is bursting with flavor. I think we can use the sauce on anything. I’m planning to coat meatballs with it next time. Can’t wait to share the result with you! 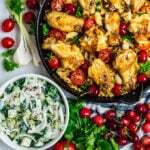 You can feed 4 people with the measurements here, so if you are planning to make these Sticky Baked Chicken Wings for a crowd, you need to adjust the recipe as needed. Baked chicken wings with a sticky sauce made with ketchup, honey and soy sauce. Preheat oven to 325F (165C). Line 2 large baking sheets with baking pepper. In a large bowl, toss the wings with oil and salt. Place the wings on each baking sheets in a single layer. Bake until lightly browned, for 40 minutes. Meanwhile, whisk all the ingredients fort he sauce in a medium saucepan and bring to a boil. Cook over moderate heat until it thickens, stirring occasionally, about 15 minutes. Increase the oven temperature to 450F (230C). Transfer the wings into the sauce. Replace the baking paper on each baking sheet with clean ones. Arrange the wings in a single layer on each baking sheet and bake for 15 minutes more. You can serve the wings as they are now or toss them into the remaining sauce and garnish with chopped green onions and sesame seeds. These are best when served hot. It’s better to heat them in oven when they get cold. Thanks a lot Adina! These wings taste really good!